Pacquiao was declared the best boxer of last decade and rightly so as he won world titles in 8 different weight classes and has been on top of his game for best part of 12 years. His aggressive and sensational boxing style and humble attitude earned him respect of fans all around the world which lead him to become one of the biggest PPV stars in the recently boxing history. Now he has agreed to fight Floyd Mayweather on 02 May 2015 which is widely regarded as one of the biggest fights in the history of sports, certainly in case of revenue Mayweather-Pacquiao will be undisputed number with over $400 million expected from just one night. 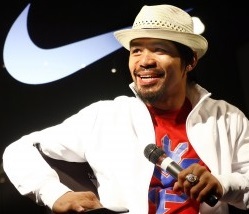 Overall Manny Pacquiao is second only to Mayweather whe we talk about PPV numbers. He has headlined close to 20 PPV events prior to Mayweather fight and his fights has sold around 13,160,000 bringing in $750 million revenue for his promotional companies in last 19 fights. Manny Pacquiao turned pro in last 90s but he had to wait till 2005 when for the first time he headlined a boxing PPV event which came against Erik Morales in 2005. 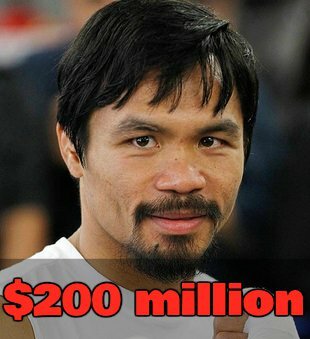 That fight drew 345,000 PPV buys and Manny Pacquiao earned his first 7 figure check of $1.75 million plus small PPV bonus. He lost the fight but came back stronger against Oscar Larios tune up fight and he defeated Erik Morales in the rematch and drew 360,000 ppv buys. After that he slowly started to make a name of himself in United States and in the next 3 years kept drawing PPV numbers of around 350,000 to 400,000 range and his purse also increase to $3 to $4 million per fight. When he defeated Oscar Del La Hoya his PPV numbers and purse increased rapidly. here is the purse details of Manny Pacquiaos last 19 fights. Endorsement Deals: Unlike Floyd Mayweather, Manny Pacquiao has had good relations with some of the biggest brands in the world. He signed a lucarative deal with Nike a few years back earning home $1 million a year while he has countless other endorsement deals in United States as well as his native country Philippines. Update: Nike dropped him from the endorsement deal after fans backlash when he spoke against the “Gay Marriages” but he went onto secure a few more deals with companies like Sony, Rexona, Hennessy and Monster energy etc. Manny Pacquiao has a tv deal with Philippines leading broadcasting network called “Solar TV” who air his every fight in Philippines and Pacquiao gets around $1.5 million from this tv deal for every fight.